I'm on a roll with finding appliances at the moment as I have a whole list to get as budget friendly as possible. Onto the hob - which will be one of our most expensive purchases (along with our boiling water tap!) and I need advice figuring out the best size. The island will be 990mm deep and 2400 wide. Hob offset to the far left - set over an 800 pan drawer set and a 150 pull out. It was supposed to be a standard 600 hob I think but I really use the hob for nearly all my cooking and regular use larger pans. I'm also worried about the splash in the area where people sit right in front of it as originally we were having a deeper island with back units (but lost them due to the cost) so it wouldn't have been an issue. I like the idea of a multi-zone hob that connects up and just thinking an 800 might be a better size. What do you think? It would still leave me 1.4m or so to the right for prep area etc. Or should I go for a narrow and wider one?? I have a standard 600. I do a fair bit of cooking and have never found the need for a larger one, plus mine sits in a nice position in the Island. I remember going to the KBB show several months ago and I looked on the AEG stand. They had multizones and I was impressed. They demonstrated them for me. My current hob is a Bosch and it’s not as good as the AEG I had before that went bang and I had to replace it. Will definitely go back to an AEG when this goes puft, bang, wallop. Looking at your image will 4 people always be sitting opposite the hob? If not then have what you want. You can always ask them to sit further along. How about a linear hob? How big is that one, @Jonathan? If you are using big pans, induction works by the base of the pan being in contact with the zones on the hob. I have a Siemens induction where each zone is effectively a square shaped quarter of the hob. If I have a big pan I can join both the left and both the right squares together to make two big rectangle zones. So I think it is more about the size of the zones rather than the size of the hob you need to look at. I have a 600mm and have never found it lacking when cooking for a family of four. If you make pastry or bread I think you will want to keep a nice big clear prep area for that as well. Mine’s a 700mm by Stoves, but I certainly don’t recommend them. It developed a fault 5 days before warranty ended and the circuit board had burnt out. They had no replacements in stock and could not give me a supply date and I was without a hob! Their customer service was crap. In the end I insisted they gave me a new one as under warranty and it’s arriving Monday. So much for British brand made in Britain! Id choose either 600mm or 800mm. There aren’t many 700mm about. Choose a standard size so that if it goes wrong it will be easier to replace. Like Jonathan recommended, we have a linear one 900x350mm and it's great; I like that is narrow and doesn't go out much, but wide enough to be able to use all 'burners' at the same time. I think I generally struggle with my current 600 wide electric hob because it has two decent sized sections, one slightly smaller and one small one. But, if I want to put say a large frying pan size and a smaller frying pan plus a mid sized pan of water on - I can't do. Mainly because it pushes the larger pan off centre. The spacing on them is not very well designed which I think is affected by where the controls are perhaps? That is why I was thinking of a wider one. But the really wide one is also great as the pans are all in front of you and it gives more splash space in front. Except I realise that I can't have the linear one now as I have already bought the extractor hood so it won't cover that size. Doh! I’d definitely consider going for an 800, or a linear one, is what I will do. If you’re finding things cheaply consider if you’re fussed about cranks - Ikea have some nice multizone induction hobs that I like the look of. Or have a look here https://www.theappliancedepot.co.uk/cookers/oven-hobs/electric/induction stock varies all the time, some is ex demo, some is graded but with marks no where that is visible...? Somewhere else to consider! Hi Tani - seating behind the hob really is dangerous - and pan handles handing over worktop edges is even worse !!! Please please please don’t put seating behind the hob and don’t put your hob less than 300mm from the worktop side. why not take your pans to a showroom and try them out on the hob. That way you'll know it will fit and the layout is good. Some things to look out for: location and ease of use of the controls. Some times your pans will be crowded and want to hang over the controls. If you want a lip on the edge of the hob. I've heard of glass corners getting cracked off. Or inset into the counter? How deep the unit is incase your planning a drawer under etc. I've seen so many induction hobs with wasted space and for me I had to think how many and what type of pots and pans I might use at any time and I found that a well laid out 600mm one was sufficient. @ OnePlan - there will be an overhang but we would never have more than 3 sitting at the island if someone was cooking anyway - or I would indeed move the stool as I wouldn't like someone to get splattered whilst cooking, haha. Thanks re the space to the side - I will see if I can move the hob up further from the edge then. I'm guessing it doesn't matter where the hob sits in relation to what is underneath it in the cupboards as they are pretty shallow depth these days, no? @Gabby - not sure re the extractor. I have a Neff one I think it is - quite powerful and quiet and we are planning a canopy overhead so I'm guessing most of the steam will have no choice but to be drawn towards the extractor. It's just that the induction hob is supposed to give off more steam than other hobs. @J - want it as flush as possible with no trim on the edge as that picks up muck too easily. Definitely need to check the position of the controls and where they are best located to get maximum space for pans. Ideally I want a side that you can join together so accommodate larger pans anyway. I think the benefit of a linear hob is that they are not deep so can be further away from guests on the other side of the island. It seems like they increase the gap by about 20cm which should make sitting opposite easier to contemplate. As far as the extractor goes- lots of extractors are smaller than the hob or you have the option of swapping what you have. Ok fab. Will discuss with the kitchen designer then to see what our options are. I just always presumed we had to have a 600 hob with a certain sized extractor. Can’t swap the latter now though. 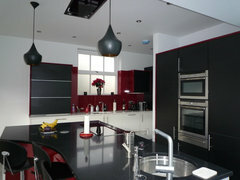 If you can’t swap the extractor then it comes down to its look. You have a pic? 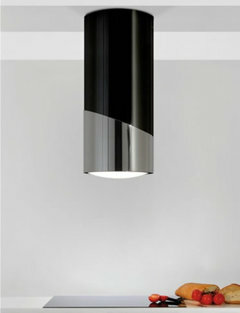 It's the one in my main image at the top of the page ie it will be built into a canopy. So actually, visually, it shouldn't affect how it looks over the hob. Originally the extractor had a 90cm glass panel around it which we removed. Once again this has helped me Tani!! So thank you for this post ..
That would be a great size for your island. I presume you are having a row of slim units at the back then? To make it 1200 deep? Also due to this we will be having rigid stools rather than swivel - if we do have swivel then soft leather seats! Currently have metal swivel - very fashionable at the time - but make lovely scrapes down the back of an island! My kitchen designer came over today. The reason for going with the 600 hob is so that it will sit within the space of the 800 wide pan drawers without having to notch out all the top of the cupboards as it will hang down into them. The quartz we can have at 30mm deep so unless the hob is shallower than that, it will hit the tops of the cupboards. We basically have an 800 drawer set then a 150 pull out (for cooking oils etc) . Yes induction hobs tend to be deeper. 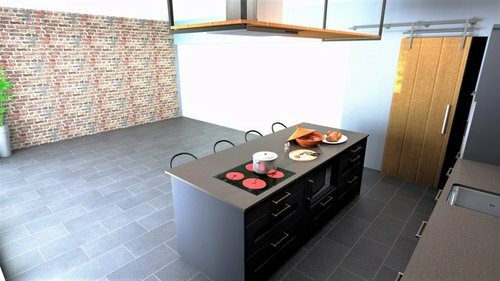 Ok in a standard 40mm laminate worktop with drawers under. I understand what you’re saying. So go with the standard 600. As long as it’s induction you’ll be well pleased with it. Induction hobs are about 60mm deep, if your worktop is 30mm and the carcase is 18mm then it will be about 10mm lower than than the underside of the cabinet top rail. The top drawer on the drawer set will just miss this if the drawer set is a 1+2 pan drawer (top drawer at 140mm). I have in the past lowered the top drawer runners to increase the gap and refixed the drawer front, you have about 10mm to play with, but the best way I've found is to change the drawer configuration (if your kitchen supplier can do this) from the 1+2 to a 2+1 so it has 2x 175mm drawers at the top and a 355 deep pan drawer at the bottom, I find this drawer combination gives you a lot more room for fitting the induction hob and it can vent properly. Before you buy any new pans just check if they're suitable by seeing if a magnet will stick to the bottom, if it does then they should work on an induction hob. Am I alone in having a load of paraphernalia around when cooking? Bottles of oils, salt, sauces etc. My island would look a total mess! In every kitchen I have fitted the carcass has had to be trimmed to accommodate the hob so siting a 600wide hob in the middle of a 800unit doesn’t guarantee a good fit as it could well hit the back of the cupboard and need to be trimmed anyway. Furthermore your hob is only going to be a little over 10cm from the edge of the island which in my opinion is not safe. So don’t be put off putting a hob across more than one unit-although obviously there are symmetrical ways of doing it that are better. In your case I would put the microwave at the end, then the two 600mm cabinets side by side with a hob measuring 900 wide and 350mm deepen the middle. If there is any possibility that the open shelf for the microwave is going to leave the underside of the hob on show then you need to order a small filler for just below the worktop. @Jonathan - I suppose layout wise, this can be changed from my original plan when the kitchen is put together? I had the one x 800 to the left as a cooking side (ie utensils in the top drawer, then pans below etc etc) then the pull out for oils then the microwave to the centre and then the last 800 drawer set was for prep ie plates and cutlery etc etc. Would it not be awkward having the microwave at the end? I could really do with going to see a load of hobs but Curry's only seem to do about 3 of them so it's hard to get a good idea of what they are like. Might have to visit a large kitchen showroom to have a nosy at the layouts then. At the moment, I am really liking the Samsung hob which has the oblong section on the left so you can have it as one large area or split down to 4. It seems to link up as one rather than when you join 2 spots together and there is a section in the centre that is colder than the rest. Not cheap though - £450 plus. eek. I’d recommend the Neff 800mm. Ours has 3 fixed zones and a flexible zone on the right to take one or two pans or a griddle pan. Don’t forget that your cooker hood needs to be at least as wide if not wider than your induction hob. Try to aim for at least 300mm of worktop before the hob starts. From experience I’ve found that the steam rises differently from pans on an induction job compared to gas and is more spread out. This article on the internet explains it better than I can. Mine was an 800 before I removed the glass - the main fan section is smaller of course so I presume that it’s the actual canopy that makes the difference ie if the extractor canopy is 800 with an 800 hob then most of the steam that rises, should hit the top of the canopy and be drawn towards the extractor. Even though we removed the glass on ours, it will be set into a suspended wood canopy so in effect, the steam should do the same thing. 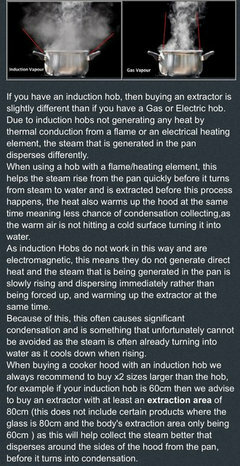 I’m told induction hobs are super steamy, ha ha. We got a Neff extractor which is also v quiet so hoping it does the trick! Agree with Otleymum, i was advised years ago that gas is a hot heat and electric is a cool heat so the extractor needs to be larger than the hob size, so with induction due to the way it cooks its even cooler than normal electric hobs. I was also advised that extractors work better if they're turned on before you start cooking ie when you start the prep work so the air in the room is already circulating towards the extractor when you do start cooking. So mine could have done with being larger then - reading that article ie as in the extraxtion area. 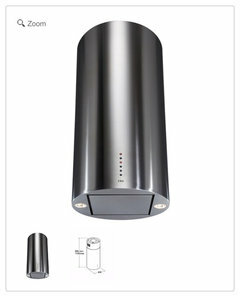 This downdraft extractor illustrates what you need is a good extraction rate not necessarily a big extractor. We would have had one of those @Jonathan , had we not already put the concrete base in. LOL. Finally made a choice and have gone for an AEG 800 wide PURE MAXISENSE induction hob which has excellent reviews. It has a super flexi top - in that you can put any sized pan ANYWHERE (OMG!) on the top and it will adjust to it. Eek. Never been so excited about a kitchen appliance before. LOL. I think that size will also look better with the island length. Will swap some of the units around to accommodate it though ie the pull out will go far left instead with the oils etc in so I have room at the end. YAY. Ooooo that’s exciting! Where did you get it from? I think I want an 800mm (or 900 linear) hob, and am going to starting thinking about it all properly soon! I’m definitely following all your posts with interest as it gives me ideas for my own work! It was half price at appliance electronics- so £500 instead of £800-1k on some sites. Seemed to have the best reviews and I spent ages looking at various options. What really made my decision was not having set pan spaces or having to faff around linking zones. It just does it for you. I’m lazy, ha ha. Yay - love a bargain and especially if it’s a good one. We are having an 800 Neff induction hob I’m nervous about our kitchen as already had manufactured say a door has to be put on opposite way and it doesn’t make sense to me. Everything else has gone so well so I’m expecting the kitchen to be a nightmare. Is our kitchen island big enough for a hob? Island .. Hob or a sink?! ?